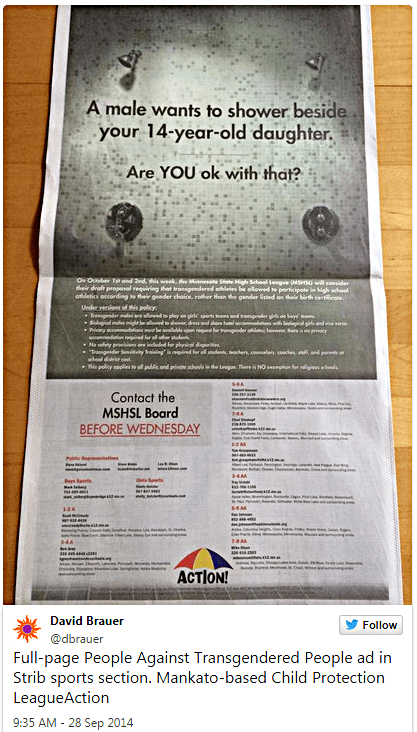 The Star Tribune of Minneapolis upset many readers this week by running an anti-transgender ad paid for by the Minnesota Child Protection League. The ad urges parents to contact Minnesota State High School League officials ahead of a meeting later this week and ask them not to approve a new policy that would allow transgender students to participate in athletics based on their gender identity. If you were doing a story on how media of all kinds (broadcast, print, digital) handle campaign and advocacy advertising, I’d consider how we could contribute to the conversation. But I don’t think that’s what you’re doing. In Minnesota, organizations and individuals of all kinds — left, right, other — know that if you want to reach the largest audience and have the biggest impact with your message, the best way to do it is advertising in the Star Tribune. TRANSLATION: We are whores who will print anything for money.